You have to admit, that the idea of Chuck’s “Mistletrap” invention is rather ingenious. Although, if he really goes ahead with this plan, I guess he’d either bump into walls and doors all the time, or poke out the eye of someone significantly larger than himself before even reaching the bar. I wonder who came up with the “kissing is allowed under the mistletoe” idea in the first place. A mistletoe-salesman, probably. But then, we’ll probably never know, as one of the definitions of “tradition” is that nobody remembers how it started. Anyway, if you choose to copy Chuck’s idea, please remember: No means no, even under mistletoe! The best thing about characters like Chuck is that they can take the blame for some of the cartoonists’ mistakes, such as mixing up mistletoe and holly…. Well, I’m not a botanist! Half of the images when googling “Mistletoe” look like, what apparently, is holly. 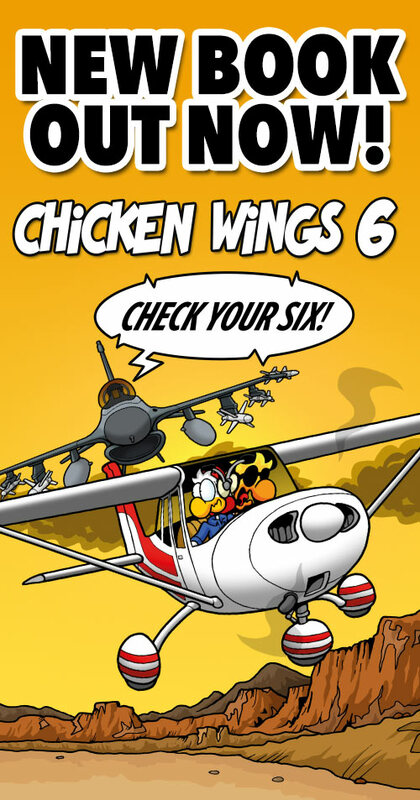 I’m a professional pilot and I always look forward to the latest “Chicken Wings.” Great job, guys. Don’t really care if its holly or mistletoe. Its a good joke. Perhaps if you consider providing a handy weapon for someone to fracture his skull with…. What is happening here? Stef is drawing mistletoe all wrong, Chuck’s shirt has only 3 gold stripes on his epaulets instead of four, KenH wants to bash Chuck’s head in, there are all kinds of historical and accuracy mistakes in this comic!! We’re gonna schedule a serious sit-down meeting to re-evaluate what exactly it is we’re doing here. “no” means “no”? Allow me to repeat the old story about a really grand diplomat and a really grand lady, and asking them a great favour. Ask a great favour of a grand diplomat, if he answers “yes” he means “perhaps”, if he says “perhaps” he means “no”, if he says “no” he’s not really a grand diplomat. Ask a great favour of a grand lady, if she answers “no” she means “perhaps”, if she answers “perhaps” she means “yes”, if she says “yes” she’s not really a grand lady. But of course such stories are from the days when “politically correct” was yet to be discovered … Grand diplomats and grand ladies have become rare, indeed.